One pan meals are such a lifesaver! We make them pretty often because they are the best of so many worlds! Less dishes, less prep, and less time. 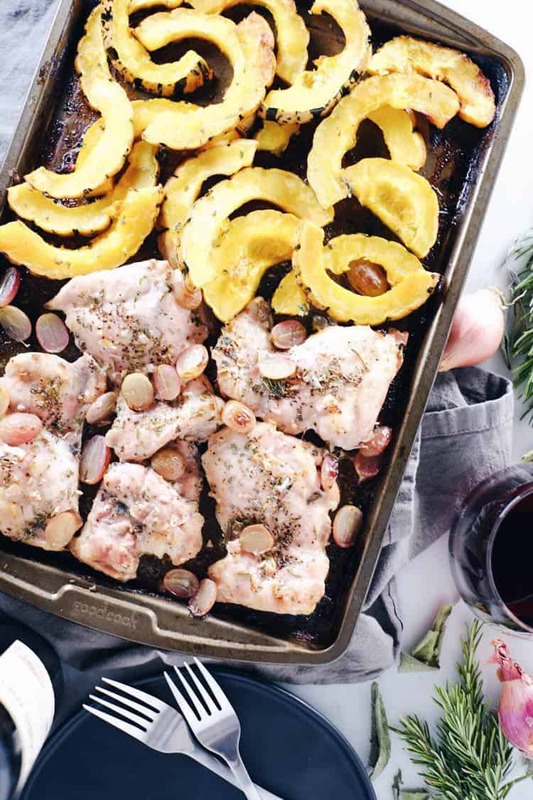 It is a win all around, and our latest one pan dish, this sheet pan chicken and squash dinner, is perfect for the fall and winter. 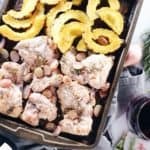 This sheet pan chicken and squash dinner is a simple dish, and yet it is packed with tons of flavor. On one half of the pan you have your chicken, which is seasoned with avocado oil, salt, pepper, sage, rosemary and shallot. Then, on the other half you’ve got your winter squash, which is seasoned with avocado oil, salt and more sage and rosemary. We used delicata squash, but you could also use another winter squash that you love, like butternut or acorn. The star of this dish, though, is the grapes layered on and around the chicken. They add this tiny bit of sweet to go with the savory notes from the sage and rosemary. It is really a unique and satisfying combination of flavors. One other item of note is that this recipe can easily be doubled. Just double everything exactly, including the spices and you’re good to go! 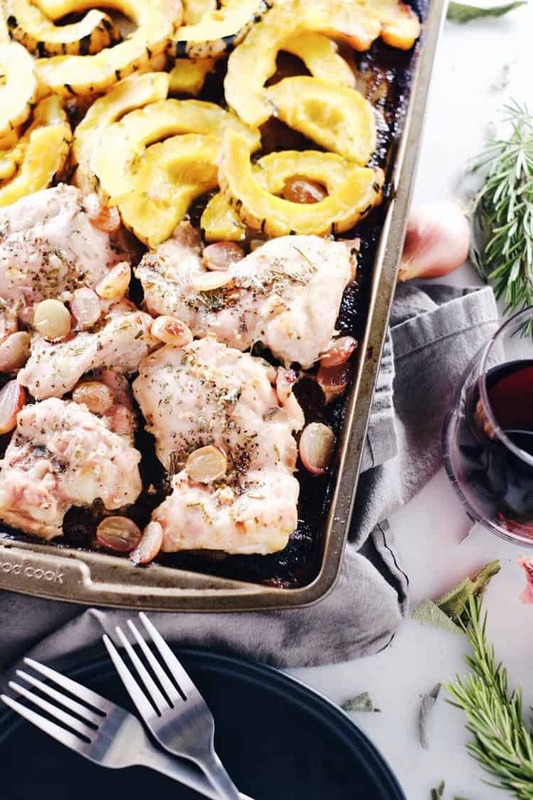 Our sheet pan chicken and squash dinner is easy to put together, and it will be baked in 40 minutes. If you have time, cut up the squash in advance. It stores well, so you could do this a few days in advance and keep it in the fridge in an airtight container. On the day you make this dish, get out a baking pan and drizzle avocado oil across the whole pan. Then on one half of the pan, sprinkle diced shallot, rosemary and sage. Place your chicken pieces on top, and season with salt and pepper and more rosemary and sage. Layer the halved grapes on and around your chicken. For the squash, simply toss it in mixing bowl with avocado oil and salt. Then, spread it out on the baking sheet. The more evenly you spread it out, the more evenly it will cook. However, there may need to be some overlapping pieces due to space constraints, and that is fine. All that’s left to do is to place it in the oven to bake for 40 minutes. Alright, you’ve got all the tools and tidbits to make this meal an easy and delicious weeknight dinner. 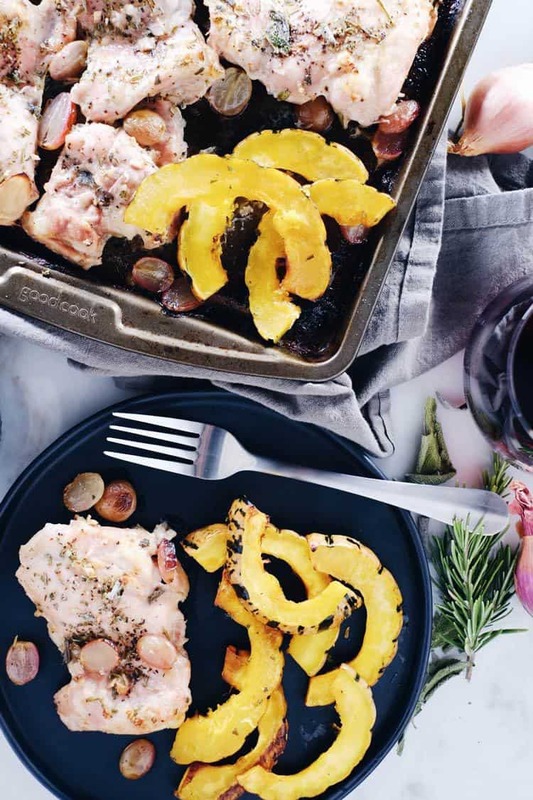 Make our sheet pan chicken and squash dinner, and let us know how it goes by leaving a comment below. Also, take a photo and tag us on Instagram @realsimplegood so we can check it out! Preheat oven to 400° Fahrenheit and line a couple of medium baking sheets with parchment paper. Prep delicata squash by cutting it in half and removing the seeds. Then, cut into half moon pieces about a 1/4 to a 1/2 inch thick. Place in a mixing bowl and toss with about avocado oil and salt to taste. Set aside. Chop up shallot, rosemary and sage. Cut grapes in half. Spread out/sprinkle all of the shallot and about half of the rosemary and sage onto one of the baking sheets. Layer chicken on top of shallot, rosemary and sage. Season with salt and pepper to taste. Finally, layer the grapes on and around the chicken. Spread out the squash on the other baking sheet. Sprinkle the remaining rosemary and sage over the top of both the chicken and squash. Place both baking sheets in the oven. Bake for 40 minutes, or until the chicken is cooked through and the squash is tender. About halfway through toss the squash around to help them cook evenly. Remove from the oven once done, serve and enjoy.